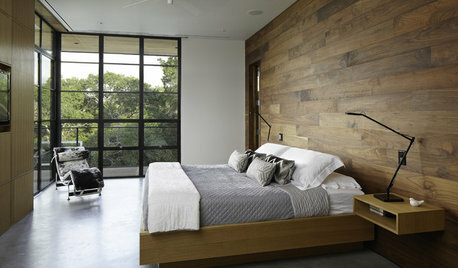 good reason to have an interior designer. When the tile man installed the tile he did not first lay it out and show me what tile goes where, and instead he decided himself and did a really awful job of it. 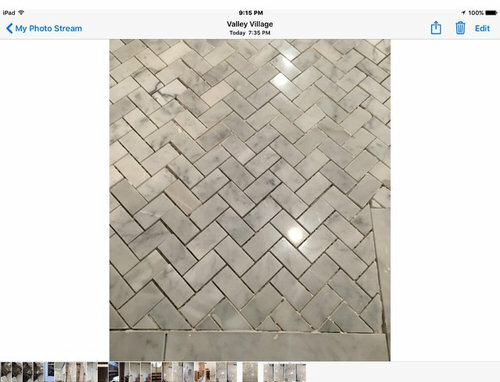 Carera is different from lot to lot and I did not realize my contractor didn't know how to instruct the tile man properly. I am busy at work all day, and this is of course, part my fault too. When I got home I saw that he had laid it out without regard to consistency and it looked terrible. I had to go to the store and pick up another box of the 6 x 12 tiles to replace the odd light colors that he randomly placed between really dark tiles. I met with tile man and we agreed which would be changed, and I left to go to work I felt the problem was solved . 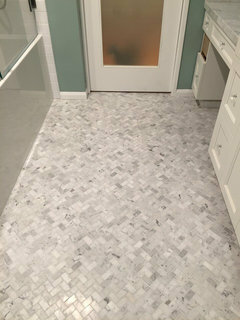 When I got back later I see that he AGAIN put a mismatched tile in the entry-- this time it is a completely different color of the herringbone sheet, and he still has an unopened box and a half of another box to choose from! You will see in the picture what that looks like. Anyhow so that is my sad story, and I need to come up with a solution. So from an aesthetic point of view I need to know how best to solve this problem? I cannot live with it the way it is. I have already spent an extra $300 that I did not count on for this floor-- and it kills me this guy was so inept at this and I should have stayed home and watched him do it. 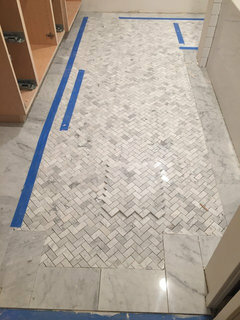 My contractor told me his tile man is so fantastic.... well, I don't agree. And my contractor should have told him to lay it out and then photograph and send to me, or insist I give approval in person, either way he did not do it. So I can't cry over would have could have should have... i just need to figure out the best way to FIX IT. 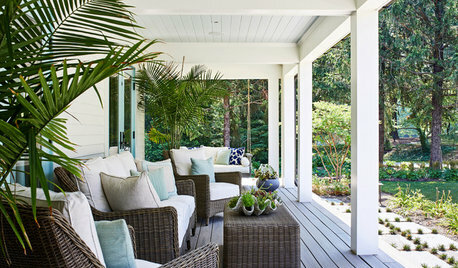 They are coming on Monday at 8 a.m. 8/22 so Houzz community please help! Alison, which doesn't bug you, the way it is now, or one of the 'fixes'? Of the choices given, I like what he did the best. What bugs me is the off center toilet. i like this way too, because the tiles are three instead of 4 tiles (2 small on the ends like it is now is really lame!) I am definitely staying home on Monday until he gets it right. 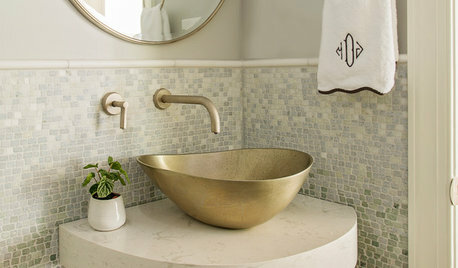 I am going there after work today to play around with tiles and see what looks good. I have had mixed votes here at work-- two designers came in with two opinions, one likes the railroaded double border, and the other liked NO border. I think the new Idea 2 that rawketgrl posted is my fav so far. My contractor said they will fix it no problem, so I am glad about that. 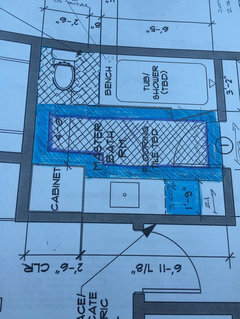 I too don't like toilet off center, but it was already in plans where it was moved to, and then the wall issue with the plumbing came to light, and we did not move it. 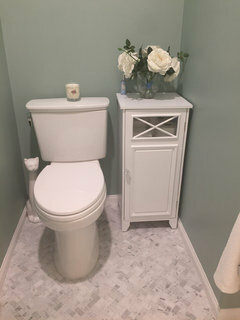 So there is more on one side of the toilet than the other side -- I figured i could put a slim little table to the left of the toilet to fill up that space. But the tile border may be a problem but I can't really take it out, as it will look really weird. It is a shame my contractor did not point this out to me and instead just plowed thru it without regard to how it would look. Do you need a border? The herringbone alone is beautiful. The border would make the toilet look even more off center and that would bug me to no end. 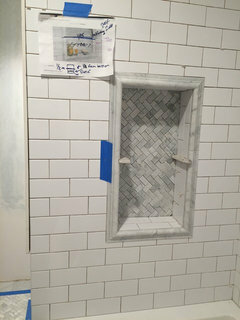 We are doing a 2 x 8 herringbone pattern in our shower with 12 x 12 marble along the walls. I plan to be there when they install so we don't run into any issues. I've already had two issues without bathroom renovation this week that I had ripped out. My votes are for no border or what rawketgrl posted. Glad you are taking care of this and that the contractor seems to want to correct it. Good work; let us know how it turns out! I think the pic of the work you don't like is fine. The color variations don't bother me. I would do away with the border if possible. If not, then square the shape off as you did in your example. To me, the border is a bit fussy in such a small area. I especially dislike it in the toilet area where the toilet is not centered. I know you said you had to have the border but if you can adjust it a bit it might minimize the off center toilet a little..
To clarify; I dislike the toilet being not centered between the borders. I have no issue with it not being centered in the alcove. If the floor was all herringbone then it would not be so noticeable. I've looked a bit online and to me the floor would be better without the border. That is so funny-- they are supposed to grout on Monday which is why I wanted to get this figured out before they get there. I did actually go over what I thought was "everything" with the contractor and the tile man.... and gave diagram, but clearly, having the diagram didn't help, because it was wrong. My fault for not demanding a new diagram when we discovered the wall issue with the plumbing having to have a new wall in addition to the wall for the pocket door. I really like everyone's ideas, and particularly-- removing the 6 x 12 border and doing only herringbone as that solves almost everything. Hmmm... going to go there later and lay out and see what makes the most sense. I had another pair of designers in the store today who liked the railroaded 6 x 12 at the doorway too, so have four votes for that idea. Remodeling ain't for sissies is it! Donuts sound like a good idea too Wacokid! I'll do it! You are correct--remodeling ain't for sissies and food/drink is definitely a great "helper". I've been through about half a dozen renovations and I've had so many workers tell me that no one had ever treated them like they were "human beings", so the small things aren't really so small. :) Good advice wacokid! I think i shall serve something spectacular on Monday morning....love all this advice and I am really warming up to the idea of pulling out all the 6 x 12's and biting the bullet and getting more herringbone. Can I leave that under the makeup area tho or just take it all out? I think you'll probably be happier if you just take it all out, otherwise it might remind you of this "issue". this whole job has been an "issue"! :) But I am glad to be close to the end, only a few more weeks.... counting the minutes. I would definitely get rid of all of the 6x12's - under the makeup area and the border. 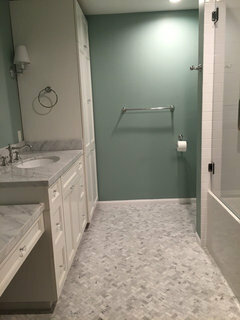 the room is not that big and the change of tile just makes it look chopped up. plus it really accentuates the off-center toilet. If you are really set on a border, it might look OK with a 3" - 4" border but I would carry the border under the makeup area as a border, not make it into a field tile there when it is a border in the rest of the room. I kinda agree with those who say craftsmen want to do a good job - but let's face it, they are not designers and often have little sense of aesthetics - they know how to lay tile flat, with good adhesion to the floor, and get the grout in, but they don't have any sense for whether it looks good and certainly can't be expected to have the same taste as (each one of) their customers. They often really resent taking up work that they have just done, so count yourself lucky that they are being patient about that. Be profusely grateful, serve food, and be there constantly - you might even hand him the squares one by one, or lay it out in order/exact shape of the bathroom, in the room or hall outside that door, so he just has to pull one tile at a time to put in. or, failing that, go through all the boxes, remove any that don't work for you, and only make available to him, the ones that work for you. Good Luck! Fwiw, it's going to be beautiful, that's a given. I think a border looks best when it literally borders the room, repeating exactly what's in front of it (including cabinets and walls), at the same width all around. 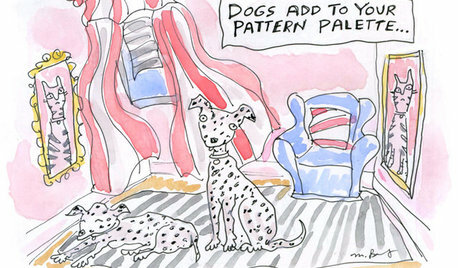 OR a rectangle of one kind of tile (for example your herringbone) so that it mimics a rug. I would be very happy with what you have...if I didn't have a choice/money/energy....But you are not and I think you might like it better with no border at all because of what's happening and the toilet being off center. NO. No cleavage, please.... just a little kindness. I had my heart set on the border but it really isn't working out with all the issues in this bathroom. I don't think the tile man will be too happy about pulling out all the 6 x 12's but I will goodies here to ease the pain. I don't think these guys really care about cleavage anyway and I am way too old for that! The toilet has bugged me being off center, and with the border it really would have bugged me so thanks for pointing that out. The solution to take border out really solves the entire issue. There are a lot of off center things in this bathroom due to the weird size. I think if I had it to do over again I might not have made such a large linen cabinet, though it is a nice luxury, that's for sure! We did that because it was supposed to line up with the toilet cubbie, but when we decided not to have a drop in tub and instead went for the alcove, we ended up with about 8" extra on the tub side. If I could have hired a designer to work the project, they would have known that with these little changes, everything had to be reevaluated and tweaked. This is my very first remodel, and it isn't as easy as it looks on HGTV. Ha ha. 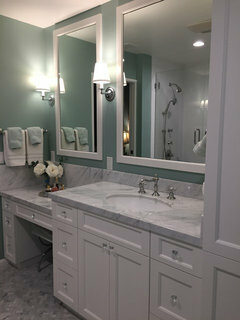 Houzz has been awesome with design ideas, and I am really grateful to all of you. Everyone has been so helpful! 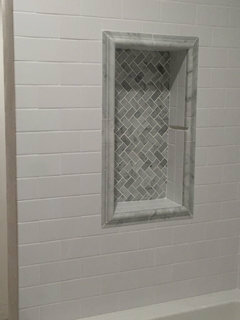 The tile man did a pretty darn good copy of the niche i found. Take a look. The middle will have a glass shelf, that is what those weird space holders are for. LOL live and learn right? 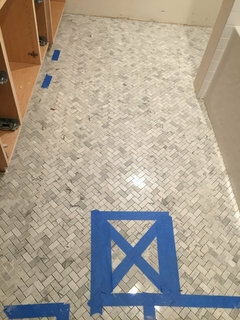 I did my own tile job on an old house of mine for the entryway and mud room, thinking that it would save me big $$. 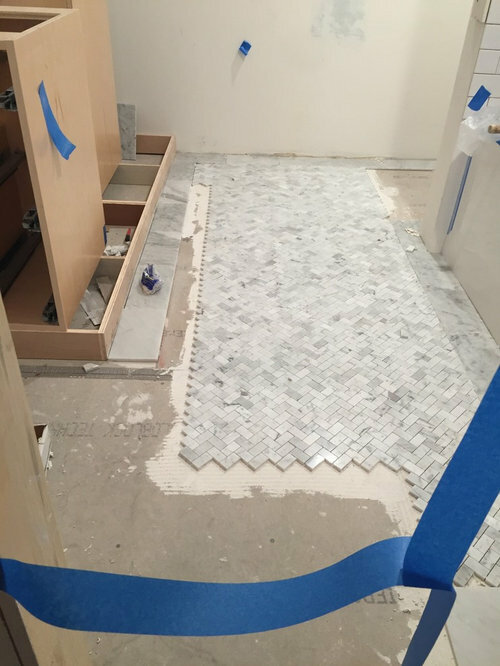 I ended up using more tile in screw ups, and with the cost of the tile saw rental and taking 5 weekends to finish it was probably more than I would have spent hiring a decent tile guy, who could have done it in 1 weekend and been done with the mess and hassle. It will turn out good, you have used great materials and it looks really nice so far! Is that a little makeup table in the blue square area? I love that idea.. Please post more pics as it goes. Yes that is a little makeup table, even though I haven't put on makeup for decades! 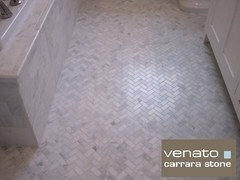 I think the Carrera marble floor will be fine, and I am planning on sealing it. You see a lot of old houses with it, so it is a durable product. I know it stains, so I will just be have to be careful. The look is just so pretty. I hope that they can fix everything in the next few days-- then they can paint the cabinets (BM color Chantily Lace) and the rest of everything can go in. 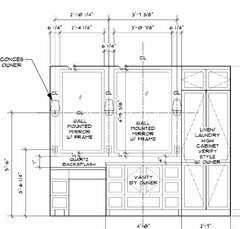 Here is the elevation for the cabinets. I think some of you are going to be bugged because this is definitely not centered. I have had mixed comments on the mirrors. Originally I thought I would have the whole wall mirror to make the room look bigger. 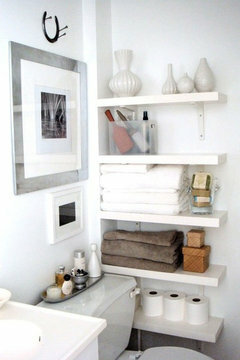 That would mean putting sconces in over the mirrors (cutting holes) and also the three electrical plugs. 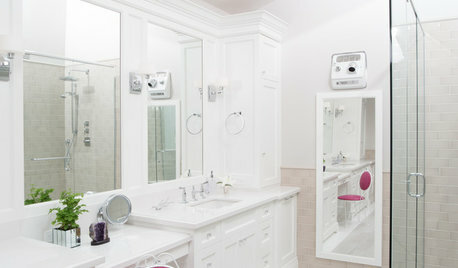 One of my designer friends thought that was kind of dated and recommend decorative mirrors. 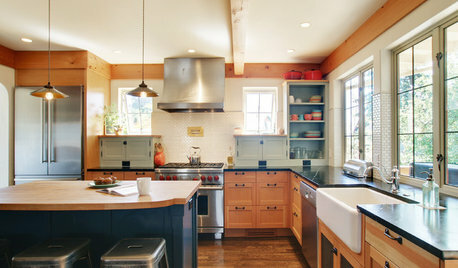 I could either use the same design (modified Shaker) as the cabinets or get something silvery. I know the day of reckoning is coming and I have to finally decide. 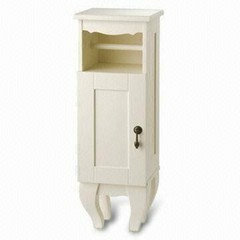 I am leaning toward as shown below with white mirror to match cabinets. The sconces are absolutely better than I thought (scoured online to find exact match to one in my idea book) and when they arrived oh so beautiful! Here is another question for you... originally I was going to do quartz, but changed my mind to do the Carerra marble top. The votes came in and instead of doing that as backsplash, using the same herringbone as on the floor with a pencil border was decided. As you can see below, having 7" over the makeup table and 4" over the vanity makes it once again, off kilter! But I think it should be ok... thoughts welcome, you ladies are so terrific! I think you should use quartz, for variety and contrast. 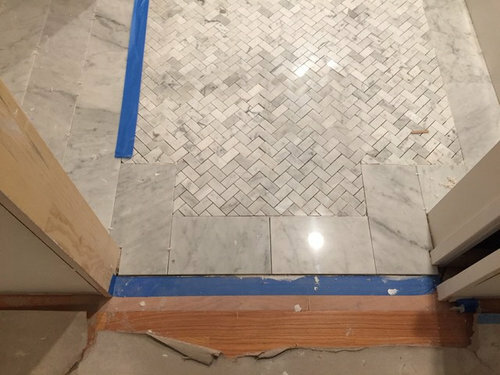 Herringbone for the backsplash. It will be fine as shown in image. I think you will find you do not need to fill up the space to the left of the toilet. I don't know why the tile person should be offended. You gave him the wrong diagram. Make it clear it is your mistake. 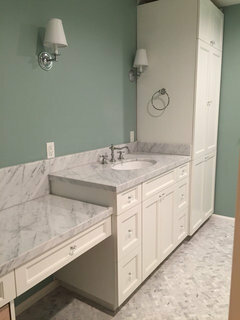 I like the niche and think your tiler has been making nice cuts on the marble. Please remember to show us the finished product. they did install the bases which is good news. I hope ripping the tile out doesn't damage them! So emmarene do you think white quartz with the cabinets? I thought having the herringbone next to the carerra would be a nice contrast. If you love the larger tiles on the perimeter could you have them cut, making the boarder half as wide? 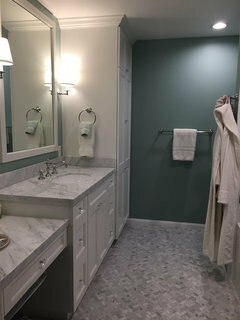 We had 12x12 Carrara marble tiles cut in thirds with our small hexagon Carrara tiles. 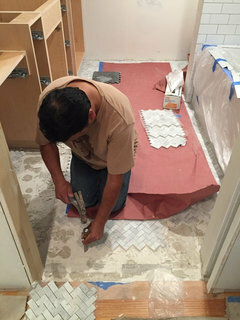 To make sure the exposed boarder was consistent my tile guys cut the pieces a bit wider that went under baseboard this left the pieces with full exposure like in the doorways the same size and grout lines straight. As the old saying goes he is chipping away. This was a much bigger deal than I realized. He had to chip out the entire perimeter so he could fit in the new herringbone tiles. 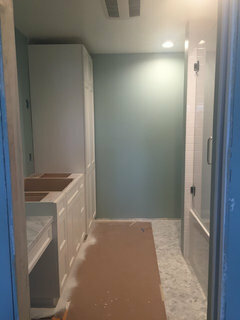 He says they will finish installing today, but grout tomorrow. Today he will grout the tub. 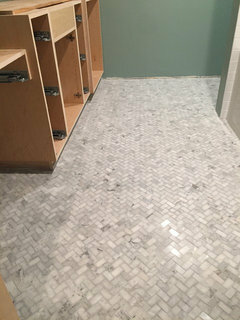 They finished installing the tile and will grout tomorrow. I hope all those zig zag lines will go away!? 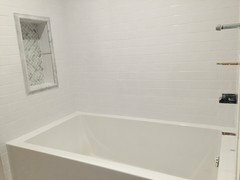 They grouted the tub, looks good. I kind of wish I had done the grey grout though the white is pretty I was getting used to it without the grout which appeared grey. The zig zag appears to be gone, and they painted today too! I am keeping my eye on the prize and when the room is done I will post the final shots. Thank you everyone for your feedback, it really helped! Its hard to tell if the dark shade on the left is a shadow, or if it's just darker tiles over there. I am loving the tub and cannot wait til the end of this! Almost there. 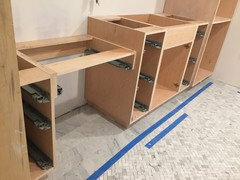 They are installing the countertops now. should i put a mirror on this wall? I thought it would make room feel larger, but there are two mirrors going over the vanity and makeup table, and I am not so sure I want to see so much of myself! No mirror. Wait until the room is finished then see what if anything that wall might need. Happy artwork might be a nice rest from all the hard/shiny surfaces in there. Getting closer to finished! Agree on mirror. Canceled it. 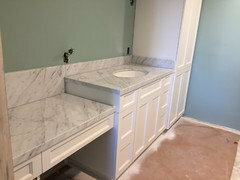 Today they finished the vanity. Yay! 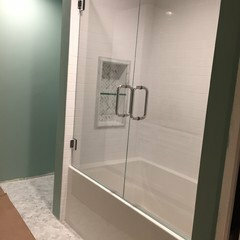 Tomorrow if I am lucky they will do the finish work in bathroom, add lighting, and hook up the toilet and the shower/tub, and then it will be ready for me to move back in my own bedroom! Almost done. Just need the molding on the top and bottom of the cabinets and one drawer front. 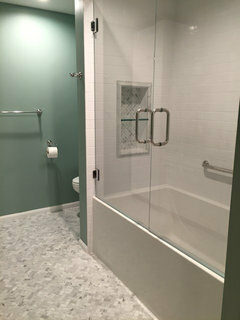 Tomorrow morning I am going to take a shower in my brand new shower tub combo. What do I call it anyway, is it OK to just call it a shower? ooooohhhh it looks so relaxing! it just needs some big fluffy white towels and Luxury! That's what you should call the tub/shower a luxury shower. nice job, looks great. Beautiful! Aren't you glad you nixed the border on the floor? So serene. Hi Jan, thanks for the comments. It really isn't as jarring in person, I have had the same paint in the bedroom (and old bathroom) because I really do like that color and it feels spa like to me. I thought about going lighter, but in the end I decided to keep same. 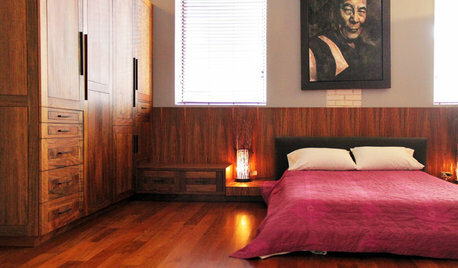 I think once the walls have the mirrors and some pretty art it will look fine. I'll post then. About the tp roll, I wasn't really sure where it would go and I asked them to line it up with the wall-- but it ended up where you see it. 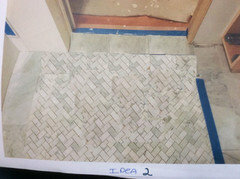 The problem that caused the debacle with the tile also caused the toilet to be left of center in that toilet closet area. So putting the roll on other side is just too far. To Indomom, I definitely am glad I took rawketgirls advice and nixed the border! 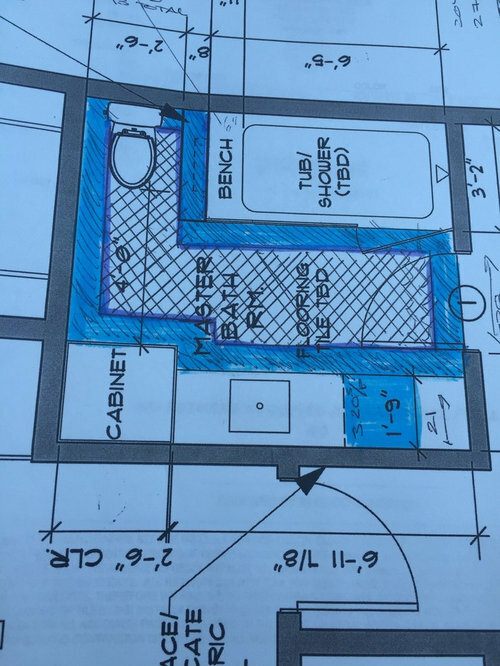 It was a very costly error, and of course the contractor took zero responsibility for not asking me to provide new plans when the tub was changed. Oh well. 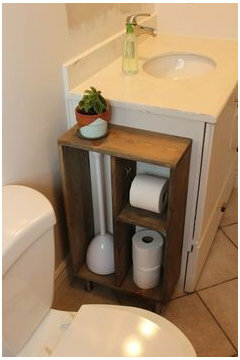 I am going to get a beautiful trash container for there which is actually perfect as there is not a real good place to put one other than there, so it worked out fine. PS, I took my first shower in there this morning and it was awesome! I wanted to take a selfie but..... :) ha ha! Finally it's pretty much done! Mirrors and molding are up and it's fabulous! I just need to finalize the artwork, and that is it. For now, I am really enjoying, and the debacle of the floor is a distant memory. Thanks everyone! 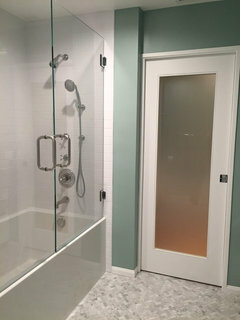 It is so elegant, may we see the shower niche? I've wanted to see the glass shelves in place. 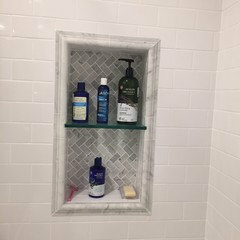 I did just one glass shelf-- my hair products are the larger pump size, and I thought best to have 12" height, which is perfect. I found this cool plastic soap thing and put the soap on the bottom ledge, and it works great.